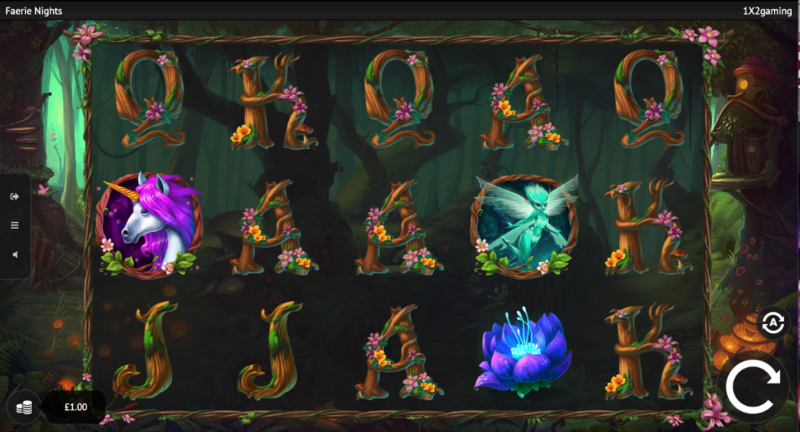 Our fantasy friends from the forest form the alliterative theme of this online slot machine from 1×2 Gaming; it’s called Faerie Nights and its’ gloomy groves offer players expanded wilds in the base game and sticky wilds in the free spins round. Faerie Nights is a five reel slot with three rows and twenty five fixed paylines; those transparent reels spin within entwined branches and through them we can see the hazy, green forest interior, home to the creatures of our imagination. The higher value symbols include a purple-haired unicorn, a blue fairy, a gnome, a butterfly, a blue flower and a pink toadstool; J, Q, K and A formed from gnarled branches make up the lower values. In the base game the wild is a tree which will expand to cover all positions on its reel when it appears; it will replace all standard symbols to help form winning combos. The fairy in the red dress is the scatter symbol. Wisp – this is a wild symbol which will stick on the reels for a variable number of spins and it can turn standard symbols into itself. Blue Fairy – if this character appears she will multiply all winnings by 2x. Faerie Nights is a really atmospheric slot with some charming music and sound effects and a clever assortment of bonus features in the base game and the free spins; 1×2 Gaming have always produced very playable games and this is no exception.